10. Quod C. Gracchus in oratione sua historiam supra scriptam Demadi rhetori, non Demostheni, adtribuit; verbaque ipsius C. Gracchi relata. 10. That Gaius Gracchus in a speech of his applied the story related above to the orator Demades, and not to Demosthenes; and a quotation of Gracchus’ words. 25. Capita rerum quae cuique commentario insunt, exposuimus hic universa, ut iam statim declaretur quid quo in libro quaeri invenirique possit. 25. Summaries of the material to be found in each book of my Commentaries I have here placed all together, in order that it may at once be clear what is to be sought and found in every book. We learn a great deal from this about how a second century author with a collection of miscellaneous material organised it. Caput is being used somewhat flexibly, but here we see it used both to indicate the summary of the content of a self-contained portion of a book — a chapter title, if you like — and also for that self-contained portion itself. We might say “passage”, but there seems no special reason not to say “chapter” and “chapter title / summary”. This tells us that Aulus Gellius himself organised his work into capita — chapters. Also that he composed these capita — chapter summaries. We may speculate that a literary slave may have been used to compose these, as Cicero had Tiro do work for him, and Josephus used Greek ammanuenses to give polish to his works. But there seems no need to suppose this. On reading the Loeb, I thought at first that we also knew that these capita (chapters) were numbered at some point. If we look at book 8 in the Loeb, we find under the chapter summaries (capita) in a couple of cases small excerpts from the lost text. These, of course, have been extracted by editors from quotation by later authors, who must have specified the numeral of the chapter. So chapter 3 has a fragment. 3. Quem in modum et quam severe increpuerit audientibus nobis Peregrinus philosophus adulescentem Romanum ex equestri familia, stantem segnem apud se et assidue oscitantem. Et adsiduo oscitantem vidit, atque illius quidem delicatissimas mentis et corporis halucinationes. 3. In what terms and how severely the philosopher Peregrinus in my hearing rebuked a young Roman of equestrian rank, who stood before him inattentive and constantly yawning.
. . . and saw him continually yawning and noticed the degenerate dreaminess expressed in his attitude of mind and body. This fragment is preserved by Nonius, II, p121, 19, s.v. halucinari. That’s not very helpful, is it? I must admit that the over-brevity of Loeb references always annoyed me! What normal person could follow such a reference? Even I don’t know who “Nonius” is, and I have a better grasp of ancient literature than almost anyone not professionally active. Which work, which edition, I wonder, is meant? But the mention of a work at the end suggests a dictionary compiler, and a search brings first the Wikipedia article for Nonius Marcellus, a 4-5th century grammarian, then W.M.Lindsay’s 1901 article, and then Muller’s 1888 edition: vol. 1, and vol.2. Finally Lindsay’s 1903 Teubner, vol. 1, vol. 2 and vol. 3. All I have to do now is track down the reference, and even so, it is still nearly impossible. HALVCINARI, aberrare et non consistere atque dissolvi et obstupefieri atque tardari honeste veteres dixerunt, ut est (cf. Gell. VIII, 3): ‘et adsiduo oscitantem vidit atque illius quidem delicatissimas mentis et corporis alucinationes’. But this gives no textual link to Aulus Gellius. So my initial impression here was mistaken. Possibly some of the other fragments will give us more information, but I lack the time to pursue this now. There is more we could learn, if we knew more about the textual history of this collection of all the capita, immediately following the preface. Because book 8 of the Attic Nights is lost. Yet we do have the capita for book 8. This means that either the collection of all the capita was transmitted at the correct place; or, that the collection of capita circulated independently. All this is valuable information on the way in which ancient authors worked. They did have chapters, if they chose. They did have chapter titles, if they chose. They did have chapter numbers, if they chose. So is there really any case for denying the authenticity of any transmitted chapter divisions, numerals, and headings, unless we find multiple different ones in the manuscripts? If so, what is it? R. Laqueur (Berliner Klassikertexte XLIII 1908, p. 220 ff) has already taken the Berlin Didymus papyrus (Diels and Schubart, Berliner Klassikertexte I, reprinted in the Teubner library) as the starting point for his statements about the literary status of the Anonymous Argentinensis. I agree with him on the whole. However, I must differ in one respect from him. The Didymus-text, just like the text transmitted on the back of the same roll, Ἠτηικη Στοιχείωοις of Hierokles (see Arnim Berliner Klassikertexte IV), has headings on the columns, which indicate, not the content of the columns, but rather the sense of the relevant portion of the work. It would be a mistake to see them as column titles: they are rather regular chapter headings. These titles were in existence before the scribe of the Didymus papyrus made his copy: this is shown by a mistake, where he has put over the 8th column the title already associated with the 7th column. Sometimes there are two headings, but also often no heading over a column; a diple or a cross sign (x) in the text clearly marks the beginning of the corresponding section. The reason why these titles were transmitted with the text is clear: the idea was to escape the whims of the copyist, even when copying the contents of a constantly shifting column. For the Hierokles text, it is also of particular importance that the transcript is from the time of the author himself (von Arnim, p. VII). But whether the author troubled himself about this material remains to be seen. It was part of the technical equipment of the book, and it had to be provided, by those who oversaw its reproduction, perhaps the corrector. So it may be related, that the title of Didymus papyrus possibly is by a second hand (Diels-Schubart p. XI), but that it was handed down for the above reason is indisputable. The diple is an ancient mark indicating where text should be inserted. It looks the same as the modern one. The publication is H. Diels and W. Schubart, Didymos Kommentar zu Demosthenes (Berlin, 1904), while the other is H. von Arnim, Hierokles, Ethische Elementarlehre (Papyrus 9780), Berliner Klassikertexte. IV, 1906, p. 48-64. The papyrus roll has the shelfmark P Berol. inv. 9780. Col. 4 (Who it was who was dragged off to the king and informed him of Philip’s preparations against him. What those who have written about Hermias of Atarneus say about him. Col. 6 A reconstruing of hyperbatic phrasing. Col. 7 What the king’s recent philanthropy2 towards the Athenians was. Col. 8 What the date was when, humbled, they (the Athenians) were receiving only 130 talents of revenue. Concerning the Athenians’ receiving 400 talents of revenue. Col. 9 That there are two men named Aristomedes, one from Pherae, the other an Athenian nicknamed “Brazen”. Col.10. Dates and cities of the speech. That the speech is by Anaximenes. Col. 11. What ὀρρωδεῖν (means). Concerning Nicaea. Concerning σκορακίζειν and the proverbial expression “to the crows”. Col. 12. But if (it is) not (νεομένους or ναιωμένους, then it is) νεμομένους.3 Concerning Philip’s wounds. Col. 13 That the speech is not one of the Philippics, but is otherwise by Demosthenes. 1. Col. 12a is the one exception: it is a critical comment about a word occuring in the text at col. 12.3, rather than a description of the column’s contents. D-S1, x-xi, mention the possibility that the column headers were written by a different hand from that of the main text. Gibson has not taken into account Mutschmann’s article — the marginal status of scholarship on chapter titles should pain us all — but this is excellent stuff, and he goes on to give a translation. But I don’t know how we reconcile Mutschmann’s comments about the titles on columns 7 and 8 with this. I wish we could see a facsimile. But it seems that we have some solid evidence of chapter titles, given here in a second century papyrus of some length as running titles, and marked in the text indicating where they should appear. But who are these authors? Well, Didymus himself is Didymus Chalcenterus. Hierocles Stoicus seems even more obscure, although his surviving work was edited by Illara Ramelli and translated into English by David Konstan — well done! — in 2009 as Hierocles the Stoic: Elements of Ethics, Fragments, and Excerpts, and is on Google books in preview here. modern (supposed) truisms do not “function as good historical arguments, nor can they be substituted for such”. An illustration of this struck me in Mutschmann. The desire to break these too-large entities into smaller parts had to prevail eventually in a period which was groaning under the weight of a too extensive literary tradition, where it was necessary to bring order out of chaos. Such periods have a natural tendency to encyclopedism. Large collections can be digested into handy compendia, containing an extract of all knowledge in a condensed form. The result is a form of literature which is less read than consulted and looked up. The result is a form of literature which is less read than consulted, and looked up. There the first requirement is convenience and comfort; literary aspirations have to defer to it. In this period must arise the introduction of chapters, of the subdivision of larger volumes. The history of the chapter (caput, kephalaion) is still to be written (2) and I do not intend to give it here: it would be a whole book. In any case, chapters and chapter titles are inextricably linked. The latter alone will be discussed here; and we remain with the same genre of literature, the historians. Diodorus also wanted to be an author, and he sought to give his compilation a literary character and the appearance of uniformity. He applied the same technique as Polybius and facilitate an overview of the work in his prooemia by brief overviews and back references, a process which I would describe as “literary argument.” All this was an integral part of his work. But purely external tools are more convenient, and were used by Diodorus eagerly in the sage knowledge of the nature of his history as a reference, not a reading work. And so the system of arguments and kephalaia is already present in his work in full bloom. Strabo has spurned this approach in his geography, because the “arguments” for it are easily recognizable as products of the renaissance: this may be indicative of the character of the writer. The reader will note the lack of footnotes in all this. The argument seems persuasive. A compendium must surely indicate what each extract is. We certainly know that authors like Martial placed titles over individual poems, compiled into volumes — the Xenia or ‘Gifts”, books 13-14 of the epigrams, sent with presents, contain them and alone explain what each little poem was sent with and therefore is about. We must demur at Mutschmann’s confident statements. Yes, it is possible that this is how things happened. I do like the picture he paints! But we must remember, always, that the ancient world was not like ours. It is self-evident that punctuation must help the reader, yet we well know that this was used sporadically and indeed abandoned by the Romans during the second-third centuries under Greek influence. It is self-evident, at least to us, that placing a space between words would help; yet ancient books like the majestic 4th century codices of Virgil prefer the pleasant appearance of continuous text. Data first. Theory afterwards. And never confuse the two. It’s the only way to do scholarship, and, if an amateur may be permitted to say so, failure to differentiate between data and deduction is at the root of nearly all bad scholarship. Più recentemente, occupandosi del problema della divisione in capitoli presso gli antichi, il Mutschmann (16) ha espresso la convinzione che tale metodo, ostacolato dapprima dalle esigenze artistiche degli scrittori, dovette diffondersi quando si sentì vivo il bisogno di mettere ordine nel caos del materiale letterario tramandato e di risparmiare tempo e fatica al lettore ed allo studioso, probabilmente nello stesso periodo in cui le medesime esigenze inducevano alla compilazione di opere enciclopediche e sistematiche delle varie discipline. More recently, in dealing with the problem of the division into chapters by the ancients, Mutschmann (16) expressed his belief that this method, which was initially hampered by the artistic demands of the writers, had spread when the need was felt to put some order into the chaotic mass of literary material transmitted and to save time and effort for the reader and the scholar, probably in the same period in which the same needs led to the systematic compilation of encyclopaedic works on the various disciplines. (16) MUTSCHMANN: Inhaltsangabe und Kapitelüberschrift im Antiken Buch, in «Hermes» XLVI (1911), pp. 93-107. Listed on Google books here but not online. I was hoping to consult Mutschmann, but I can’t find his text online. I’m ridiculously busy, but came across — drat, I was interrupted by the phone even as I typed that! — … but I came across a very nice article online about the ancient paragraphos in — drat, interrupted AGAIN! — … about the ancient paragraphos in French here, complete with a very nice photograph of a papyrus. The papyrus was found in the South-West of the Fayum in Egypt in 1901-2 by a French archaeologist, reused in cartonage, and contained portions of a lost work by Menander. The article links to the announcement of the discovery here, identified by three words in the colophon — Sikuw/nioj Mena/ndrou a)riqmo\j… — which was followed by a numeral indicating 1,000. The article is not quite correct — the paragraphos, the line in between the lines, indicates that somewhere on that line is a division marker — often a colon, or perhaps a space. In a modern text each speaker would be on his own line. Not so in antiquity. I always wonder, faced with such comments, how we actually know that this is so. The article tells us that Aristotle mentions the paragraphos in his Rhetoric, and that it is the only punctuation mark he mentions. I was unable to locate the passage in Aristotle, tho, as no reference was given. A sentence should break off with the long syllable: the fact that it is over should be indicated not by the scribe, or by his period-mark in the margin, but by the rhythm itself. ἀλλὰ δεῖ τῇ μακρᾷ ἀποκόπτεσθαι, καὶ δήλην εἶναι τὴν τελευτὴν μὴ διὰ τὸν γραφέα, μηδὲ διὰ τὴν παραγραφήν, ἀλλὰ διὰ τὸν ῥυθμόν. But the period should be broken off by a long syllable and the end should be clearly marked, not by the scribe nor by a punctuation mark, but by the rhythm itself. After my last post, I was wondering what the paragraphos and coronis marks in a papyrus looked like. A search on “paragraphos coronis” in Google quickly revealed that each had a Wikipedia article, albeit a pretty empty one: paragraphos and coronis. The point of this note is to inventory the paratextual elements that are found throughout the text of Zostrien, and to specify their function. Placed in the right margin, and lightly continued into the text, between the lines, these elements appear in two variants. As we shall see, they correspond exactly in form and function to what the ancients called paragraphe or paragraphos (gramme), i.e. the marks of a paragraph or a unit of the sense. In fact the paragraphos consists essentially of a horizontal line which begins in the right margin and is continued between the lines, and which can be reinforced by an oblique bit, giving what is called an “non-linear crochet”. Furthermore the paragraphos serves most often mainly to draw attention to an indicator of division placed in the line. This is very often a colon ( : ) followed by more or less white space. 3. The paragraphos is therefore similar in function to the coronis (korw/nij), except that this, as its names indicates, appears “in the form of a semi-circle open towards the right”, like an “anti-sigma” (D. Muzerelle, Vocabulaire codicologique, Paris, 1985, p.127, § 422.12; cf. V. Gardthausen, Griechische Paleographie, zweiter Band, Die Schrift, …, Leipzig, 1913, p.403-4). On the difficulty of distinguishing the two terms, see H.-M. Schenke, Matthaus-Evangelium im mittelagyptischen Dialekt des Koptischen (Codex Schiede), TU 127, Berlin, 1981, p.20, n.33. The article is of great interest on these papyrological terms. Yet the signs appear in the 6th century Pliny manuscript M.
More tomorrow — those search terms seem to give such interesting books in Google books! I’ve returned to looking at Diana Albino’s article on ancient chapter divisions and summaries, and I was rereading my translation of a long chunk here. Already in the papyri, in fact, the various parts are often separated from each other by intervals of spacing, or through the device of protruding into the margin the first letter of the initial line of each section, or by means of special signs to indicate diplh~, korwni/j and paragra/foj. … These ways of subdivision are also preserved in the Middle Ages. Thus, in codex M (end of the 5th century, beginning of the 6th) of the Naturalis Historia of Pliny the Elder, the chapters are marked by empty intervals or capital letters or even the sign of coronis (8). (8) Cfr. K. DZIATZKO: Untersuchungen ueber ausgewahlte Kapitel des antiken Buchwesens, Leipzig, 1900, p. 53 and pp. 113-114; PLINII Naturalis Historia ed. SILLING, Gothae 1855 voI. VI, Proleg. pp. 18, 20, 26. Dziatzko’s book is online at Google books here. P.53 merely gives a general description of the manuscript ‘M’ of Pliny’s Natural History, which is a palimpsest of the Stiftes St. Paul in Kämthen Kärnten, numbered III (formerly LXXXVII), written in majuscule around the start of the 6th century. It contains most of books 11-15. It was first used by F. Mone for vol. 6 of his edition (Gotha, 1855; hence ‘M’). The material in question is on p.114, and discusses the sections arising from the content, which are delimited by larger letters and gaps in the text. The divisions, especially in the latter part of the manuscript, are marked by a new line and a disengaged letter in the margin. But in some cases there is a large letter in the margin, for no obvious reason. Dziatzko speculates that this is the remains of a paragraphos signalled in the ancestor copy. Hier wie sonst noch öfter steht am Ende der vorausgehenden, nicht vollen Zeile, überdies die Koronis. — Uebrigens sind, was nicht zu verwundem ist, manche Abschnitte an Stellen angesetzt, die man anders und auch besser auswählen könnte. Here, as elsewhere more often, we find the Koronis, at the end of the previous line, not the whole line, moreover. – By the way, unsurprisingly, some divisions are in places where different and better ones could have been chosen. I could see no mention in all this, however, of numerals in the margin, indicating that the sections were numbered and perhaps connected with the author’s table of contents in book 1. The book is an interesting one, tho, and deserves to be better known. I only wish my German was better! UPDATE: I was wondering where “Kämthen” might be. A google search leaves me still in the dark. Might it be “Kempten” in Bavaria? But if so, where is this St. Paul monastery? UPDATE2: But it turns out — thanks to JS in the comments — that I simply had an OCR error, and it is really Kärnthen, or Kärnten as it is today! An email brings me word of a new publication by F. Schironi on the ends of books and the titles that appeared there, mainly connected with Greek poetry. A systematic and chronoloical investigation into the nature and development of end-titles in papyrus rolls and codices of hexameter poetry from the III century BC through the VI century AD. 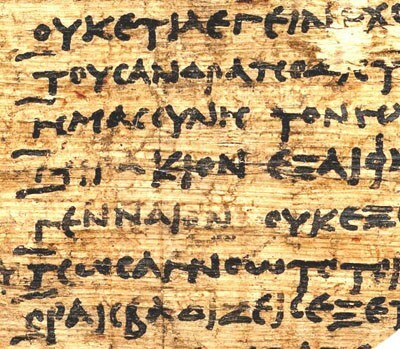 The bulk of the evidence for presentation of hexametric verse derives from Homeric papyri (51 papyrus copies), although Hesiod’s Theogony, Works & Days, and Shield(two), and Oppian’s Halieutica likewise supply data (one). For comparative purposes the author also provides a sampling of end-titles in non-epic genres. The discussion of individual papyri and summation of the results are rich and informative. Includes bibliographical references, charts with comparative statistics, and pertinent indices. The present article is a very brief summary of a monograph I have completed which consists of an analysis of the way ancient manuscripts (rolls and codices) containing hexametric poetry mark book-ends. I have addressed two main questions: 1) if and how these manuscripts mark the end of books and how end-marks change over time, especially with the adoption of the new format of the codex; and 2) how epic poems in rolls and codices were arranged, in particular whether, after the end of one epic book, another book followed and, if so, where it was placed, i.e. in the same column (or page) or in the next one. The present analysis allows us to identify some clear patterns and to understand the way ancient manuscripts containing epic and above all Homeric poetry marked the end of books and organized their content over a period of time ranging from the 3rd century BC to the 6th century AD. The paragraphos was one of the signs used to mark the end of a book and it consisted of a line at the left margin stretching under the first letters of the last line of the book. This line was used to separate visually the last line of a book from the first line of the next book. … The papyri in our data set prove that the common claim that Ptolemaic papyri used to have the entire poems written continuously in one, very long roll without distinguishing one book from another is false. … All the codices available to us have an end-title. This is normally in the full form of the genitive of the name of the poem, followed by the letter designative of the book which has reached the end. It is very good news that this summary paper exists, so that thereby this intricate subject may reach a wider audience. It indicates that the monograph must be a work of considerable interest and precision, and I sincerely hope the conclusions are taken seriously and not merely forgotten. Now what about a similar study on prose texts? I’m still looking at the question of whether ancient books had divisions within a book into “chapters” of some sort, and whether they had tables of chapters at the head of each book, and whether the divisions were numbered, and whether the titles in the tables were in the text or not, and whether any of this was authorial. The Ecclesiastical History of Eusebius was edited in the SC series at an early stage. Books 1-4 of the HE appears in 1952 in SC31, edited by G. Bardy, in a volume which contains only a brief introduction, and then the text (reprinted from the GCS, 1909) and translation. It is all a far cry from the sophisticated volumes we know today, but from such little acorns has such a forest of mighty oaks grown. In the manuscripts, following the ancient usage, the table of chapters appears at the head of each book. But in the text, each chapter is prefixed only with a number in sequential order. Two more volumes contained the remainder of the HE; but by 1960 it was clearly felt that a proper volume of introductory material should have been required, and Canon Bardy was at work on such when he died. It finally appeared in 1973. It contained a section on “books and chapters” on p.101-113. The first ten pages are devoted to the division into books, made by Eusebius himself. The remainder consists of assertions about chapters rather than useful discussion. The conclusion is the same as above. In SC 206 (1974) J. Sirinelli addresses the same question in his edition of the Praeparatio Evangelica (p.52). The division into books of the PE is by Eusebius himself. The author refers several times to this division himself. Very often he mentions that he is coming to the end of a book, or is beginning one. We are thus assured that the division into books is indeed his work. As regards the titles of chapters, it is generally admitted that, for the Ecclesiastical History, Eusebius himself divided the books into chapters and composed the titles for them himself. On the other hand there have been disagreements concerning the Praeparatio Evangelica. In his 1628 edition Viger reproduced the titles and the summaries of the books. Valcknaer in his Diatriba de Aristobulo wanted a more rigorus edition created in which the titles and divisions would be suppressed, in which according to himself Eusebius had no part. Finally Gaisford himself wrote with decided authority “Lemmata, quae in prioribus editionibus non singulis tantum libris sed et librorum capitibus praefixa orationis nexum saepe perturbant, amovi”, and on his own initiative created a new division, which is currently the basis of reference and was followed by Gifford. Karl Mras, basing himself on an article by J. Bidez [Revue Critique d’histoire et de littérature, N.S. 61, 1906, p.506; a review of Gifford], sensibly reintroduced these titles and summaries, which in all appearance are the work of Eusebius himself. In fact in various ways the titles supply us with indispensable information, not given by the text itself. This is because, reasonably, the author knew that he had furnished these in the title. For example we may look at chapter 3 of book IV, and chapter 3 of book X. The title alone contains the reference to the citation which follows. We place ourselves alongside the opinion of Mras, therefore, and while retaining the division of Gaisford, we give in the appropriate places the titles of the chapters. This is not a matter of indifference. The division of Gaisford is arbitrary, and sometimes unfortunate for the sequence of ideas. On the contrary the division into chapters given by the manuscripts, far from disturbing the flow of the argument, permits us in some cases to restore with more clarity the sequence of thought by Eusebius. We will have occasion to refer to this again. But with caution; because, for book I, the situation is complicated by divergence between the manuscripts. One of them, V, reproduces the titles at the head of the chapters in the body of the text. In the other manuscripts, at least for the first chapters, the text of the title of the chapter appears only in the summary at the head of each book. The chapters indicated in Arabic numerals are those of the Mras edition; reference is always to these. No modern edition takes account of the ancient division into chapters (with titles) which derives from the Greek manuscripts. This problem — that the witness of the manuscripts is not published in modern critical texts — renders it very difficult to acquire the necessary information about how ancient texts were divided. … Gifford was wrong not to place the titles at the head of each chapter. Sometimes these titles are the only fact we have on the provenance of an extract (e.g. book XV, ch. 17, for a chapter taken entirely from Numenius). UPDATE2: I find that I have a copy of volume 1 of Mras’ edition also.On p.viii of the foreword he discusses chapter titles. I give the German word used to facilitate searching. The volume references are to Mras own edition in the GCS. 3. Eusebius not only prefixed the books with tables of contents (“Inhaltsangaben”), but also intended the headings (“Überschriften”) for the chapters in the manuscripts. J. Bidez has rightly complained in his review of the Gifford edition that the editors since Gaisford have omitted these headings. There is hard evidence that these originate with Eusebius: that the third chapter of the fourth book is from a work of Diogenianus we learn neither from the text, nor the table of contents (“Inhaltsverzeichnis”) of the fourth book, but only from the chapter heading (“Kapitelüberschrift”) (Vol. 1 p. 169, 21); the title of the work of Porphyry — and the number of the book — quoted in the third chapter of the tenth book, is only given in the chapter heading (Vol. 1, p.561, 12f. ); book 11, chapter 30 begins Πάλιν Μωσέως καὶ τούτους; this τούτους is incomprehensible without the preceding chapter heading Περὶ τῶν κατ’ οὐρανὸν φωστήρων; likewise chapter 32 (vol. 2, p.68, 15) Καὶ περὶ τούτου is incomprehensible without the chapter heading Περὶ τῆς ἀλλοιώσεως καὶ μεταβολῆς τοῦ κόσμου; XV 5, 1 (vol. 2, p.355, 17) πρὸς τοῦ δηλωθέντος — who is meant here we discover only from the chapter heading. The author cited and his work are listed only in the headings of the chapters or sections in the following cases: IX 14,3 (vol. 1 p. 500, 9f. ); X 10 (vol. I p. 591,6): only at the end (p.595, 18) is Ταῦτα μὲν ὁ Ἀφρικανός named (without the title of Africanus’ work, however; the title is missing also in the table of contents of the book); XIV, 7 (vol. 2, p.303, 11f.) : in the table of contents only the name of the author is given *; XIV, 22 (vol. 2, p.320, 13) gives the name of the work, Philebos (the table of contents of the book says only Ἀπὸ τοῦ Πλάτωνος — Plato); XV 14 (vol. 2 p.378, 17f. ): in the table of contents both the name of the author and the work are absent; likewise XV 17 (vol.2, p.381, 9). As we can see, the more accurate information is in the chapter headings, as is natural; the author first provides for each chapter the appropriate indication of contents; gathering these into tables of contents at the start of the book is then a copyist task. This explains some small differences (although they are never contradictions). Of course it is Eusebius who has ordered that these collections should be placed at the head of each book. * Do not be deceived by the Κεφαλαίων καταγραφή of Gaisford, Dindorf and Gifford; they present a mishmash from the tables of contents and the chapter headings. There is a lot of solid information in there. One thing that I do not see, tho, is discussion of whether these symptoms could be accounted for by damage to the inherently fragile tables of contents, rather than by the priority of the material embedded in the text.